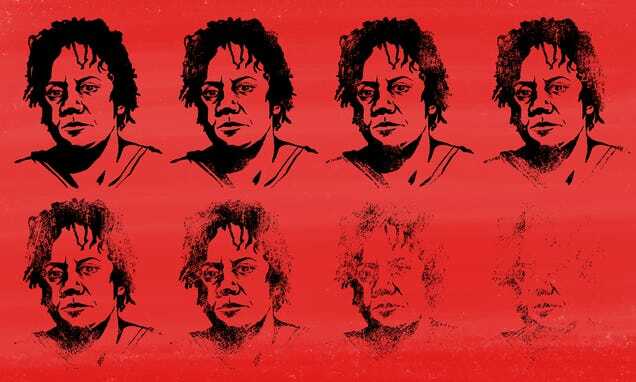 On August 14, 2014, just days after Michael Brown was fatally shot in Ferguson, a police officer in Phoenix, Arizona fatally shot Michelle Cusseaux, a 50-year-old Black woman living with bipolar disorder, schizophrenia, and depression. Michelle Cusseaux had called for a taxi to take her to the hospital. When the taxi didn’t show, she called her case manager. The case manager called the police to take her to an inpatient mental health facility. Four police officers came. Words were exchanged. Police took the door down. A few minutes later, Michelle Cusseaux lay with a single bullet in her chest. She died soon after. A week later, on August 22, activists carried Michelle Cusseaux’s casket to City Hall. The march was led by Frances Garrett, Michelle Cusseaux’s mother. Michelle Cusseaux’s body lies a-mouldering in the grave, but her soul goes marching on. The Phoenix police knew why they were going to Michelle Cusseaux’s residence. They called Frances Garrett to determine if she had ever had a gun. She had not. They knew this situation. Their knowledge made no difference; their knowledge executed another Black women, another Black woman living with mental illness. Michelle Cusseaux’s death echoes that of Shereese Francis, in Brooklyn, in 2012.